We hadn’t been to Paris, but we’ve traveled to different cities and different countries. We’ve worked in big cities like Boston and New York and visited Chicago and Los Angeles. Also, there were some information sources that were more “trustworthy” than others. We expected that while there would be a lot of tourists in Paris, the people who lived there would be going about their everyday lives. We expected some language issues – my French was rusty, but I could form basic sentences and read most signage and menus. We expected to need some help with directions, but our research included detailed maps of the city, so we knew the general vicinity of major landmarks. 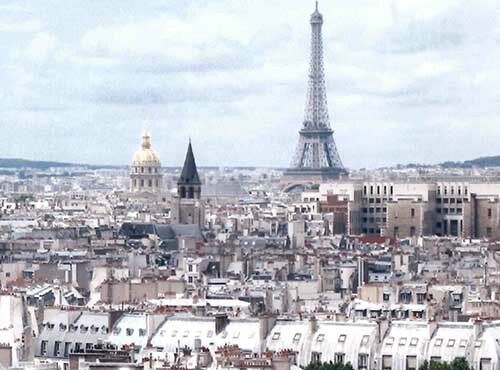 We expected that most of the “myths” about Parisians were just that – myths. The French hate Americans. False. There are more permanent displays of the Statue of Liberty in Paris than in New York. There’s a major boulevard named after Franklin Roosevelt and museum exhibits of Thomas Jefferson’s inventions. We were welcomed warmly everywhere. French waiters are rude. False. While sitting at a sidewalk café, we watched our waiter, with a full tray, take a moment to guide a blind man through the crowds and down the narrow sidewalk. Maybe French waiters in high-end restaurants are rude, but we went to local cafés and bistros. Of course, waiters at posh restaurants in Hollywood and Manhattan can also serve courses in rudeness. Parisians don’t like Americans trying to speak French. False. Not everyone in Paris speaks English. That included the nice woman who fixed my broken eyeglasses (free of charge). The only person who corrected my French was a Metro clerk after I mistranslated “my ticket doesn’t work”. But she smiled while she gave me a new subway pass – at no cost. Parisians dress very stylishly. True. I was very impressed with how fashionably most people were dressed, whether going to work or out for the evening. And that included days when it was hot and I was glad I was wearing shorts. What you expect to happen has a direct impact on your experience. The way you approach a situation changes your perception and your attitude. Your expectations will influence the result. When starting a project, you should expect the project to succeed. If you take the opposite point of view, you’ll look for reasons the project should fail. That may mean overlooking opportunities that could be exploited to achieve your goals. What do you expect from the people around you? At work? At home? If you start with a negative attitude about people, it will be difficult for even those who are trying to do good to change your mind. If you start with a positive point of view, you’ll be giving people a chance to succeed. You get what you expect. If you expect a project to fail, you’ll view every minor setback as a potential catastrophe. If you expect people to work hard to achieve their goals, you’ll see their best efforts in all attempts, even when they fail. And if you expect to have a wonderful time on your vacation, you probably will.